(f) to exercise a general supervision and care over all matters affecting the welfare of the aboriginals, and to protect them against immorality, injustice, imposition and fraud. Well, to say that Horrid Hump fails miserably to protect the Aborigines in his charge is an understatement. The duty of his patrol officers is to make these Wards of the State assimilate i.e. These patrol officers – whose pastimes were primarily gambling, fornication and binge-drinking – had a grand old time assigning new whitefella names to assist in the assimilation process. No more jaw-breakers like Arripiatunwangu and Wurrawunapungala to tie their tongues into complicated macramé knots. No, henceforth the Wards of the State were known as Chisel Teeth and Hammer Toe, Fuel Drum, Shoelace and Rawhide. Sixteen year old Sugar wanted to keep the name she’d had all her life. Dhurrpu, but she wasn’t allowed to. It was no comfort that in time Ralphie, the most empathetic of the patrol officers came to realise that to destroy language was to destroy the fabric of an ancient civilisation. Aboriginal culture is not romanticised. Most readers will flinch when they learn that twins were bad news in Aboriginal culture and it was custom to kill them both. Sugar solves the problem by leaving one behind in the hospital for further treatment, but inevitably she loses them both to the white culture of taking Aboriginal children from their mothers – in overt defiance of their own Ordinance that makes it an offence for any Aboriginal to be removed from the boundaries of a reserve of aboriginal institution. 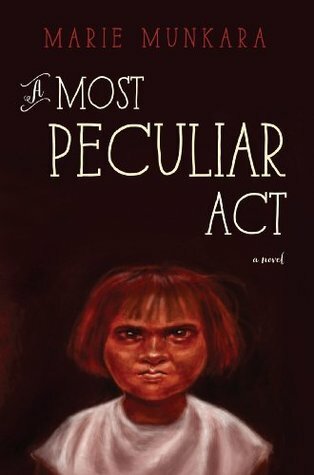 A Most Peculiar Act has a similar style to Munkara’s debut novel Every Secret Thing (see my review). It is a picaresque collection of incidents, each one pitched at satirising the provisions of this ‘most peculiar act’. It is ribald, mocking, sometimes slapstick and always rich in biting sarcasm. Occasionally the author’s clear voice can be heard as when Horrid Hump’s view that there was no place for primitive cultures is described as a frighteningly blinkered view shared by many others at the time and a belief that still persists to this day. If this novella has a flaw, it’s that there are so many Aboriginal characters who are not fleshed out and made memorable in the way that the white characters are. Apart from Horrid Hump and Ralphie, there is also Drew Hepplewaite, an appalling racist who tricked her way into being appointed as a patrol officer before it was discovered she was female; and Penelope, the Administrator’s wife, who is having an affair with Chou Chou, her Chinese personal attendant. Only Sugar is a fully developed Aboriginal character, learning the hard way that passive resistance is the best way to handle the irrational provisions of that ‘most peculiar act’. The cover design is by Tracey Gibbs and the cover artwork is by Julie Dowling from the Badimaya language group in Perth. Yu can see a profile of Marie Munkara at Deadly Vibe. She is a great storyteller isn’t she? Such a great sense of humour. One of those writers you’d like to have as a dinner party guest! I’m glad that you decided to read Marie Munkara’s novel, A Most Peculiar Act, for this year’s Indigenous Literature Week. I admire Munkara’s use of humor, satire, and history to explore issues of child abduction, sexual and physical abuse, and political corruption against Aboriginal people. Including excerpts of Aboriginal Ordinances Act for each chapter was an interesting narrative choice but I think that Munkara could have peered down some of the content in each chapter or made a stronger connection between it and the narrative. I enjoyed reading the novel. I had the pleasure of reading Munkara’s new memoir, Of Ashes and Rivers that Run to the Sea. She shares her experiences of awkwardly adjusting to a mission lifestyle and developing a personal relationship with her birth mother, siblings, and extended family. Munkara’s memoir was an interesting read as well. I’m finishing the young adult novel, Grace Beside Me, by Sue McPherson. McPherson’s novel takes place in a dominant aboriginal community and centers on the protagonist name Fuzzy. Fuzzy is an Aboriginal girl who lives with her grandparents and learns about her ancestral history and culture from them. Through Fuzzy’s point of view, readers are able to learn facets of Aboriginal history and customs as well as the value of community and self-empowerment. McPherson’s novel reads like a memoir as opposed to a fictional story. She may have drawn from personal experience and/or the experiences of other Aboriginal people. There is a strong thread of collective responsibility running through Grace Beside Me. I encourage readers to read this novel. Hi Sonia, thanks for joining in the conversation, and thanks for your recommendation of AMPA. Yes, Grace Beside Me is another good one, I think it won the David Unaipon Award…. Interesting that Kim Scott in Benang uses a similar strategy of including excerpts from the 1905 Aborigines Act and official correspondence from the WA Chief Protector as a counterpoint to Indigenous pov narratives. It’s dreadful that the decrees of (mostly) old white men in government have such a disproportionate effect on Black lives – right up to the ‘Intervention’ currently in place in the NT. I’ll definitely give this author a try. Yes, but you know, I knew about those dreadful decrees… everyone does. What this book achieves is the detail of the irony. Each quotation from the act is matched to an ironic counterpart and it really brings home afresh just how dreadful, how outrageous it was. I read this in the way that I’ve read books about slavery, the way I read reports about ISIS, and I get overwhelmed by thinking, how could they to that to fellow human beings? As for the Intervention, words fail me. It’s not even an issue in the media any more, there’s no reports about its effectiveness, it’s just airbrushed away. And yet the whole thing is predicated on racism – C21st Australia! I won’t ever agree that any group should be treated differently to any other group. If there is child abuse, then charge, imprison and rehabilitate the guilty ones, and only the guilty ones, not a whole community.based on the colour of their skin. I will never forget seeing on TV an Aboriginal man saying, in a tone of bewilderment and frustration, that he had worked hard all his life to do the right thing by his kids, and yet here was the government telling him he wasn’t even allowed to manage his own money any more. The legal policies against Aboriginal people were entrenched in racism and cultural intolerance. To take total control over an ethnic group’s lifestyle, culture, family, and means of financial support is unjust and unwarranted. I recently became aware of the Aboriginal Journalist and Activist name Stan Grant. He has a new memoir published this year entitled, Talking to My Country. Grant’s memoir has been well received in the media and he’s been featured in the Sydney’s Writers Festival. From a review of the memoir, I’ve learned that Grant offers commentary on the legal policies used against Aboriginal people and the prevalence of racism that still exists within Australian society as well as reflections on his family’s life experiences. Grant’s memoir would be a good selection for readers to gain insight on issues of racism and disenfranchisement. Yes, I read that earlier this year. What encourages me is that his high public profile might encourage people to read it even if they’re not particularly interested in indigenous issues.